With days to go before the opening of the very first RHS Chatsworth Flower Show, excitement is mounting for what is set to be an innovative and fresh approach that breaks the boundaries and blends tradition with unexpected, innovative design, writes Sandy Felton. 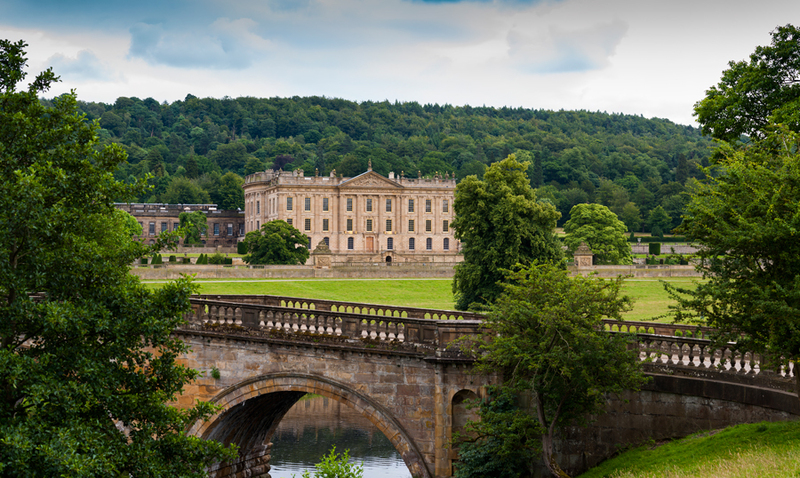 A flower show could not be set against a more awesome backdrop – the magnificent Chatsworth House and Estate – with the delightful Derbyshire countryside adding to the experience. Among the Show highlights will be The Great Conservatory. This will be at the heart of the show and is a representation of Joseph Paxton’s Great Conservatory, measuring 40m in diameter and 14m high. In a nod to Paxton’s inventive nature, it has been created using new inflatable technology. Inside, the visitor will find raised beds constructed by Paxman Landscapes and lush tropical plants positioned by the Chatsworth garden team, led by Head Gardener Steve Porter. It houses more than 40 large architectural trees and palms, 5,500 tropical plants and 300 banana plants. Cityscapes will hang an installation above the display. A large suspended structural framework of plants and LED horticultural lights is shrouded in a cloud of mist, showcasing new ways of using new growing technologies. Almost every banana grown in the western world today is the result of one man’s quest to grow bananas to grace the table of the 6th Duke of Devonshire. Then, as now, growing such exotic fruit was complex and its success created considerable excitement. Supported by Fyffes, the display will bring the story of the Cavandish Banana to life and explores Joseph Paxton’s role in its success as one of the most commercially exported banana crops in the world. Visitors will be offered a sensory experience of floral artistry as they cross the Palladian-style bridge, designed by Matthew Saxon with floristry by Jonathan Moseley. As visitors step onto the bridge they will enter a world of plants and flowers. The ceiling is adorned with hanging plants, with ferns and bromeliads wrapped in foliage and moss and baskets dripping with a mixture of traditional and exotic flowers. The sides of the bridge will contain intricate bamboo structures inspired by the bamboo walk at Chatsworth and featuring a range of charismatic flowers ranging from cold to fiery hot shades. For the inaugural show there are eight Show Gardens, a living source of inspiration. 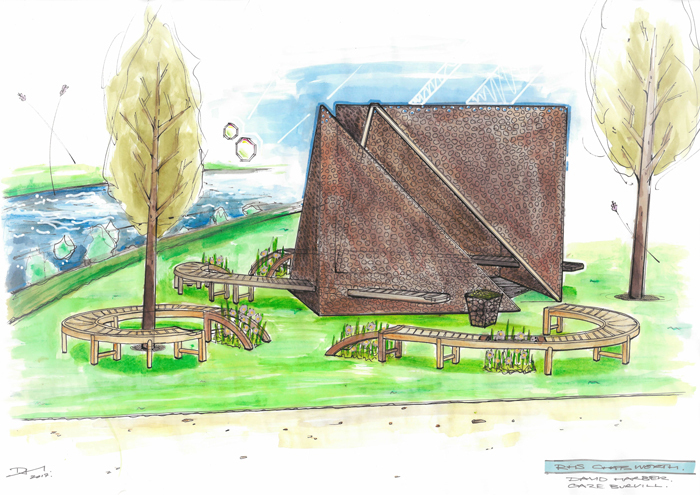 These include The Wedgwood Garden, (pictured above) designed by Sam Ovens, who will create a traditional garden with a twist and Tanya Batkin’s Moveable Feast, featuring a mobile garden designed for a couple living the letting lifestyle. 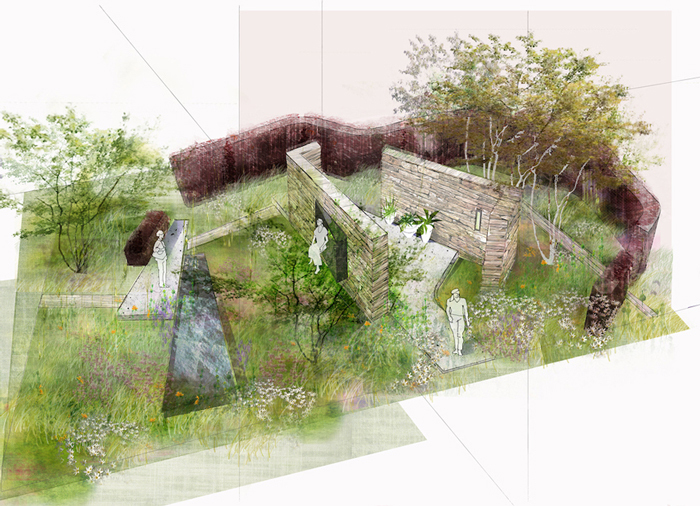 The Quarry Garden designed by Paul Hervey-Brookes is inspired by the life-cycle of a quarry, drawing attention to the habitat created by quarry sites. Cruse Bereavement Care’s garden A Time for Everything, designed by Neil Sutcliffe, reflects his personal experience of terminal illness. 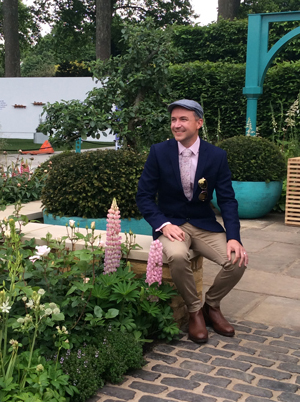 Lee Bestall (pictured left on his Chelsea garden) has designed the Experience Peak District and Derbyshire Garden, inspired by the historic houses and gardens of the Peak District. Butter Wakefield has designed a garden for Belmond – The Belmond Enchanted Gardens – showing a blend of tradition with unexpected, innovative design. Fleur Porter and Melinda Thomas of Sanctum Garden Design are designing a garden for Bristol based Agriframes promising a space full of surprises and references to the innovative creativity of the past. Jackie Knight, well known to visitors at RHS Tatton for her enchanting water gardens, will show her garden ‘Jackie Knight’s Just Add Water‘ with natural and calming water tumbling over pink sandstone rocks into a tranquil central pool and stream. I have a feeling that this category is really going to excite visitors, judging from the garden plans I have already seen. This category is unjudged and encourages freedom of expression to celebrate the connection between plants, sculpture, art and people. There are eight entries in this category and you can be sure there will be entries from visually arresting sculptural installations to features with a powerful and provocative statement. The Brewin Dolphin Garden, designed by Jo Thompson, has an imposing contemporary sculpture crafted from reinforcing steel bars. Curves and Cube by David Harber (pictured above)in collaboration with Gaze Burvill, takes its inspiration from Chatsworth House and its landscape. Behind the Scenes by Elisa Tomat and Barbara Negretti pays homage to the unsung workers behind professional gardens. Pic n’ mix: A Garden Grotesque for 2017 designed by Tony Heywood is a symbolic landscape for our anxious times while Path of Least Resistance, sponsored by Leeds Beckett University and designed by Francesca Tomany and Zuzanna Golczyk is an independent student led project aimed at promoting sustainable gardens of the future. The Wordless Cupboard designed by Sheena Seeks is a landslide of glacial boulders leaning against a 3 metre high twin cube structure. The theme captures the inability to communicate in words. The Aspire and Achieve Foundation Garden designed by Guy Taylor Associates, Matthew Fountain reminds us that Joseph Paxton himself came from humble beginnings and needed the faith of others to show his skills and grow into one of our greatest design revolutionaries. Finally, one design I am looking forward to is The Marble and Granite Centre – Anthithesis of Sarcophagi, designed by Martin Cook and Gary Breeze (above). 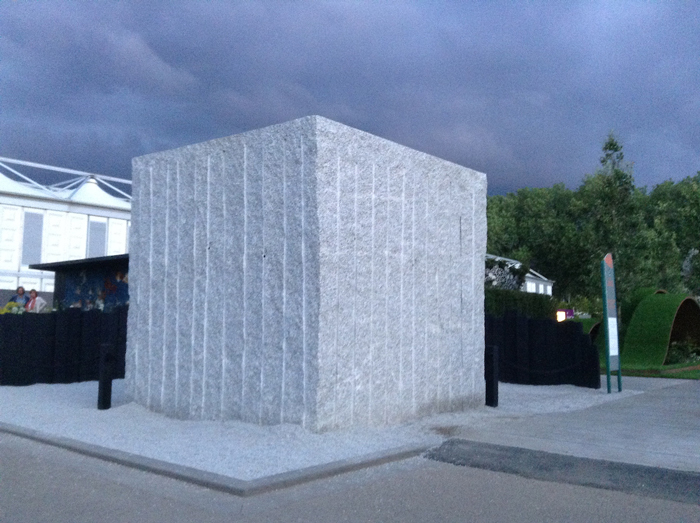 It represents a world turned inside out; a garden inside a sculpture; captured in a forty four tonne rough granite cube. This garden was shown at RHS Chelsea in 2016 and won a Gold medal. It is fascinating and I am delighted to have a second chance to see it again. A People’s Choice award will be given to the favourite design in this category. As with all RHS Shows there will be Floral Marquees and a Plant Village with nearly 80 exhibitors filling both Floral Marquees. Five local groups will also showcase the age-old custom of well dressing, unique to the Peak District, dating back to Roman and Celtic times. In the Artisan Kitchen Theatre there is an exciting programme of demonstrations and visitors will no doubt have a moment of nostalgia when they see the Rhubarb Farm: The 1940s/Hard Time Garden, an exhibit of a war-time garden sitting side-by-side with the contemporary equivalent of a garden for ‘hard-times’. Each has been created from a requirement to grow food for the family in times of difficulty. There is a special installation – The Invisible Wind – by Andrew Lee, inviting the viewer to be more aware of the air that surrounds them and the Garden Theatre will find host Martin Fish with horticultural experts as well as specialists in beekeeping and floral design. Photo credits: Banner ©Chatsworth House & Estate; Wedgwood Garden ©Sam Ovens; Lee Bestall ©Reckless Gardener 2017; Curves & Cube ©David Harber/Gaze Burvill, Anthithesis © Martin Cooke & Gary Breeze.